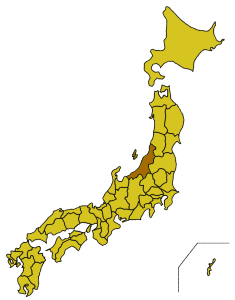 Niigata prefecture (新潟県 Niigata-ken)  is on the Japan Sea coast of the central Chubu region of Japan. 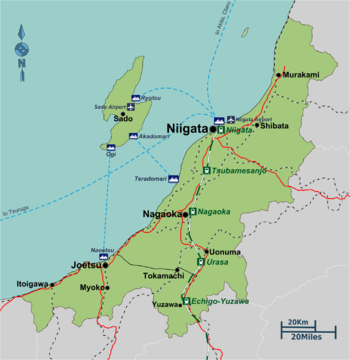 Niigata was formerly divided into the provinces of Echigo (越後), on the mainland, and Sado (佐渡), a large island off the coast. My Mother is a Tractor, by Nicholas Klar. A former English teacher with a witty and informative take on Japanese society. Written from the depths of the Niigata countryside. Niigata — the prefectural capital. Murakami — castle town which is famous for hotsprings and salmon. Shibata — castle town which is famous for Tsukioka Onsen. Izumozaki — Small town.birth place of the 18th century monk-poet Ryōkan. Tokamachi — famous for its snow festival, the first in Japan. Itoigawa — famous for Itoigawa Geopark. Myoko - well known for its onsen and great skiing. Nearby Lake Nojiri is also a popular summer retreat. Joshin'etsukogen National Park - the second largest national park in japan. Niigata Airport handles international flights from Korea (Seoul daily on Korean Air), China (Shanghai and Xian three times weekly on China Eastern, Harbin four times weekly on China Southern), and Guam (twice weekly on Continental). There are also frequent domestic flights from Osaka (¥25,100 one way), Sapporo (¥28,700 one way), Fukuoka (¥31,700 one way), and other cities. The prefectural government has produced an airport guide (), which may be useful. Every year, around the last ten days of July, there is a big fireworks display in Kashiwazaki, which is well-known for the ones which are shot off over the Japan Sea. Moreover, the number of the fireworks shot off there is about 15,000 shots and those are so beautiful. Niigata is the heart of Japan's Snow Country, which means it's a great place for skiing (see above destinations). Niigata is famed for its koshihikari rice, generally considered one of the best grades in the country. Thanks to its famous rice and abundance of mountain streams, Niigata produces some of the best sake in the country including famous labels like Kubota (久保田), Koshinokanbai (越乃寒梅) and Hakkaisan (八海山). See also "Japanese sake tourism" article. This page was last edited on 28 March 2016, at 08:32.